The sun is an incredible source of energy. Solar energy is created by the light and heat of the sun. Installing solar panels allows you to harness that energy and convert it into electricity. Through this process, solar energy can power households and heat elements (water and air). On the Gold Coast solar power is even more advantageous due to the extended solar energy Gold Coast generates. In 2017, there were more than two million Australian households with solar systems installed. Solar technology has advanced significantly over recent years, with the introduction of the Tesla Powerwall. The Tesla Powerwall allows owners to use the energy stored rather than relying on the grid. This will reduce the overall cost of future electricity bills. Solar panels produce electricity directly from the sun’s energy. The panels connect to an isolating switch, then to an inverter which converts the DC power produced by the panels into AC power that can be used at home. The power is then channeled into the electricity grid. The grid feeds electricity to the house during times when electricity consumption is greater than solar power production (e.g. during the night). 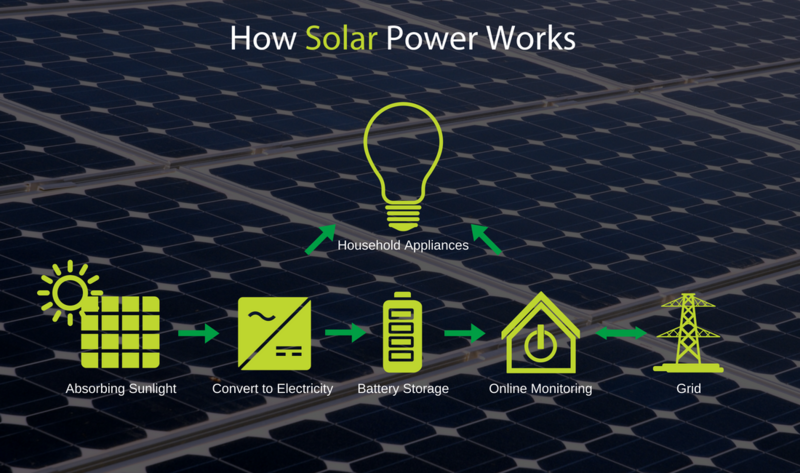 Electricity produced by solar panels power appliances that require energy during the day. These appliances include your air conditioner, refrigerator, microwave, television, etc. This is the standard process of distribution for most Australian states. What Solar Systems are available? Grid connect solar is the most common solar system within Australia. You’ll find a lot of homes use this design because it is one of the most cost effective solar solutions available. This setup simply means your system is connected to the mains electricity. Therefore, when you are generating more energy than you are using, the excess gets sent to the grid. And in opposite, when you are using more energy than you generate, excess energy required is drawn from the grid for you to use. All excess energy generated is credited a feed-in tariff by your electricity retailer (think Energex or AGL). Within Australia, ‘hybrid’ is used to describe a solar energy system that connects to the grid AND has a solar storage solution attached. How this system operates is simple; excess energy you generate during the is stored in your battery. This allows you to use your battery to power your home at night instead of relying on the grid. If your battery is full and you continue to produce excess energy, it will be sent to the grid and you will be credited a FiT. However, should you require more energy than you have stored in your battery, you will draw the excess energy required from the grid just like a grid-connect system. If you aren’t a big energy user, this option could see you earn money from your solar system. Although not the most common, this is the choice we recommend for customers in Australia. There’s a couple of reasons for this. Firstly, we know that the Government will no doubt continue to introduce rebates for solar, and more importantly batteries, in the coming years as the push for the 2030 target continues. Therefore we suggest customers hold off on purchasing batteries until these are introduced. Secondly, battery technology, whilst pushing boundaries in the solar world, are still not as cost-effective for homeowners as they will be. We believe in providing home owners with the best possible solar system to ensure the highest return on investment. If we genuinely believe your home would benefit more without a battery, that’s what we suggest. 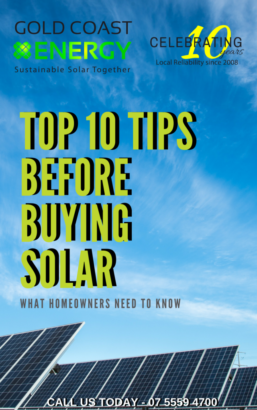 So what we do recommend is having a high quality solar system installed on your property, so when better loans AND more affordable battery solutions rollout, we can provide you with it straight away. How do the Benefits of Solar Panels Work in Different States? Queensland & NSW both offer feed-in tariffs. Feed-in tariffs pay the owner of a solar energy power system a premium per kWh of solar electricity per hour they feed back into the grid. There are currently two different models running in Queensland and New South Wales. In states with a net Feed-in Tariff (QLD), power produced by the panels first reduces your electricity bill at the standard rate. Any excess solar power that is fed into the grid earns you the premium Feed-in Tariff. With QLD losing its premium .44c Feed in tariff on the 1st of July 2012, new customers will gain most from their solar system by using the power they generate instead of sending it to the grid. In states with a gross Feed-in Tariff (NSW), the metering arrangement is slightly different. All electricity generated by the solar power system flows out of your solar power meter in your meter board (fuse box). The electricity you use in the house then either comes from the solar panels or the grid. Excess solar power distributes to the neighbourhood. What Happens to Solar Panels in a Blackout? During a blackout, the inverter disconnects itself from the grid to protect the lives of personnel working on the power lines. As we know, Queensland weather can be pretty volatile, especially in summer. If you wish to have a back-up power supply, you must purchase a separate inverter and battery bank. You can purchase a solar system without a battery. We can provide cutting-edge Gold Coast solar power storage solutions. Contact Gold Coast Energy if you wish to use a battery bank to be off the grid.